I have a confession - I LOVE PUMPKINS. When I was growing up my father was what is known as a "gentleman farmer". He grew up on a farm and wanted to give us the same kinds of experiences but he also had a full time job as an insurance agent. So what we did was part-time farming. Each year we planted several acres of pumpkins for wholesale and retail sales. My parents would track our planting and hoeing hours and pay us an hourly rate plus we made a commission on our retail sales. I almost always had a couple of hundred dollars for Christmas shopping each year - and it was well earned. Hoeing row after row of pumpkins in the burning hot and muggy New York State summer heat while getting bitten by black flies the size of quarters is no fun at all. This is one of the "faux" pumpkins you can buy at any craft store. They are made from a foam like substance and can be carved like a regular pumpkin. 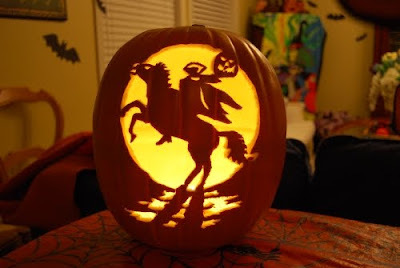 Here I've used one of the pumpkin carving patterns from the books you see everywhere. The one note of caution - the little bits of foam will get ALL over you when you are doing this. After I was done I added a little electric light (DON'T use a real candle as your pumpkin will melt) from the craft store and Voila! a reusable indoor decoration! Have you gotten your spooky on today?